Modify Existing Airports Or Create New Ones! 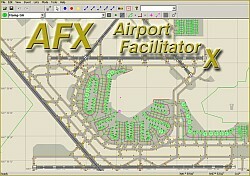 AFX allows you to add, modify, or remove runways, taxiways, and paths, taxiway signs, aprons, start location, navaids, parking spots and many more airport features. For FSX airports, it can add fences, moving jetways, vehicle links and parking spots. The utility also gives you access to FSX-specific runway markings and other attributes. Can import both stock and add-on FSX and FS2004 airports in the BGL format. Allows you to to see the airport you are editing and all editing actions LIVE in Flight Simulator. This allows very easy positioning of airport elements relative to buildings, terrain features and other aspects of the scenery. When the mouse is inside the AFX window, a second mouse pointer shows the corresponding location directly in Flight Simulator. Displays the plane position in the AFX window. Can lock the viewpoint in the AFX window to the plane location. No learning curve needed for users familiar with AFCAD. Lists of Parking Spots, Taxiway Designators, Runways, Start Locations, Comm Frequencies, Navaids. Ability to create new airports. Conversion between FS2004 and FSX airport formats in both directions. A Fault Finder will find many common problems in the airport design. Can use imperial or metric units. This program is a great companion to customers of Instant Scenery. The combination of both programs will allow you to create airports both large and small, from the ground up. The E-Commerce enabled download executable is about 5 MB in size. The purchase screen will appear when you run the executable. The servers do support Resume, however we do not recommend certain download managers because they can sometimes corrupt large downloads. This version is for non-commerical use. Developers interested in using the tool for commercial use see section below. Windows XP Recommended - Although Airport Facilitator X may operate under Vista, Flight One can't make any guarantees that you will not encounter problems when using the software with Vista.